In January, Buffalo's mortgage foreclosure crisis hit the national newstands via a cover story in Business Week. I wrote about it here - Dirty Deeds & Toxic Title. The problem of course is a total twister, some legal slight of hand and a sadder than sad housing market that has slipped to zero in some sections of the city. What happens when the bank initiates a foreclosure proceeding and - learning that the house has become a liability and has lost its asset value - never takes title, thus stranding the unwitting former owner with future liability for house that's no longer occupied and worth, most probably nothing. Strange, but true. Well, I learned today from former Buffalo NY housing activist Richard Kern - now 'exiled' and living in Minneapolis - that the City of Buffalo is suing 36 financial and lending institutions in part to cover the cost of demolitions that it incurs when the 'bank' doesn't complete the foreclosure and leaves everyone hanging. I've archived the 96 page Summons and Complaint - 'Buffalo & Brown v. 36'. I'll be following the case and tracking responding papers. I wouldn't be surprised if this isn't an NPR or New York Times story in the making. Should be interesting. I was in Housing Court this morning hoping to meet the owner of 1325 Michigan Avenue. She was a no show. Judge Nowak issued a warrant for her arrest. I wrote about this place recently here, Last Chance? If anyone has cash and a plan for the last remaining cool commercial structure on Michigan Avenue - just a few blocks from Artspace - let me know. Housing Inspector Michael Schieber and I talked about before the case was called. He's agreed to allow access to anyone who is serious about rennovations at this location. I asked the Judge for 30 days. Interested, let me know. I'll make arrangements with the City's third floor. Otherwise, 1325 is dust and another addition to the ever expanding and increasingly larger urban prairie. I noticed this sign the other day, just a block south of Artspace on Main Street at the south east corner of Dodge. 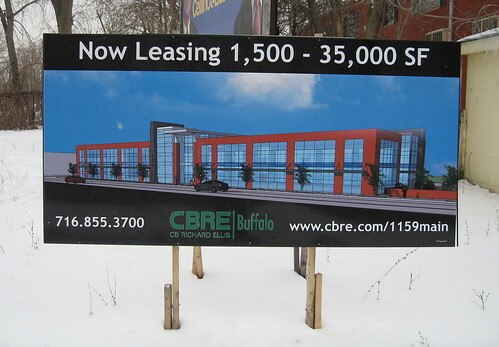 1159 Main Street is a brand new development welcoming medical practices and bioscience businesses looking to capitalize on a Main Street location adjacent to the Buffalo Niagara Medical Campus. 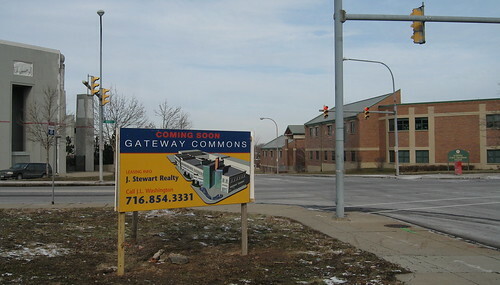 This development offers a state-of-the-art facility centrally located amidst an established Buffalo neighborhood. Savarino Companies has been retained to develop the project by a private investment group. Silvestri Architects has been retained to provide design and engineering of the project. 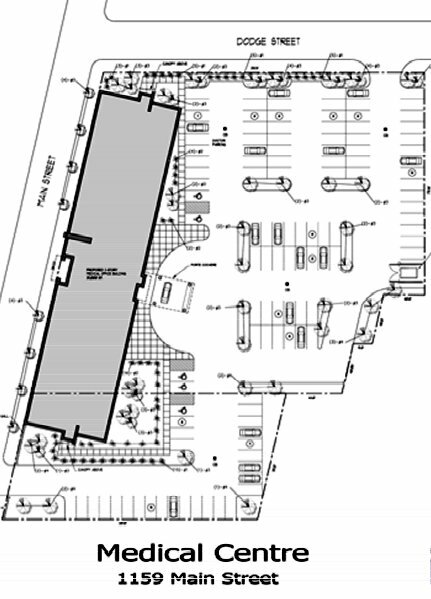 Here's the site plan, too. If anyone knows more about the construction schedule, let me know. 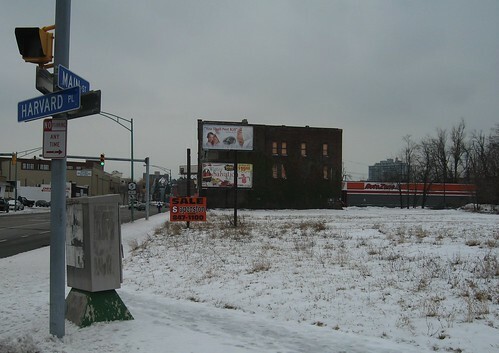 I'll be in Housing Court on Wednesday morning - 2/27 - asking Judge Nowak to stay the demolition of 1325 Michigan Avenue, a spot that I posted about last month and one that Chicago based architect and frequent Buffalo Rising contributor David Steele wrote about, too - Where is the Plan? - in January. Well, last weekend I took a closer look at 1178 Michigan Avenue, a few blocks south. It was wide open so I decided to poke around. Sure it needs work and the wooden shed structure (last pic) along the Dodge Street side has to go. Yet, on a cold and wet day in the middle of February the place was dry on the inside. I saw no evidence of any roof leaks. And wouldn't you know...the City of Buffalo has owned this building since November 2005. Very cool spot as it's just around the corner from Artspace and a few blocks north of the medical corridor. Always thought it would make an amazing live/work space. Here a few more images. Interested? Let me know. I may be able to help negotiate the maze down at City Hall. Rod McCallum invited me over to 195 Glenwood Avenue on Saturday morning. 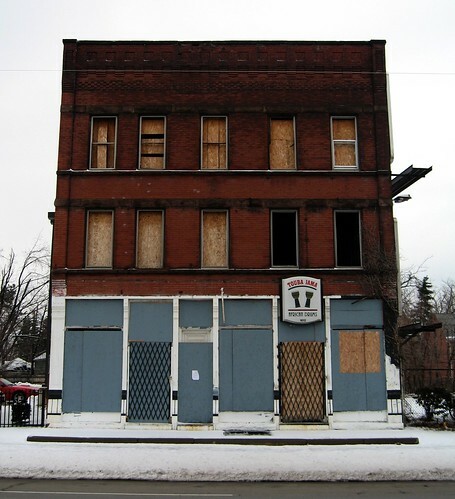 He'd recently purchased this structurally sound 3/3 Buffalo double at the City's tax sale last Fall. I first met Rod and his family during the first scheduled Artspace Back Yard Neighborhood tour in November 2006. He'd learned about 194 East Utica - future home of Queen City Farm - from this post, Saying Goodbye. Since then Rod and I have spoken at UB and in front of a number of community groups about un-locking the potential of the City's near East Side. During the past 12 months Rod has identifed numerous homesteading opportunities on what everyone is beginning to call the farm block. I first mentioned 195 Glenwood two years ago - Wide Open in the 'Hood. Rod has spent considerable time and effort recently cleaning out and securing the house. His plan is to make this place home. Rod's decision to move his family from the City's West Side should come as no surprise to fixBuffalo readers. 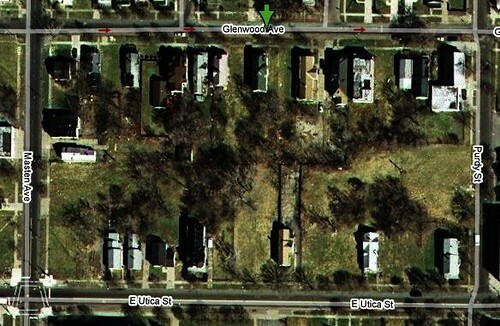 195 Glenwood is located - see map pic - directly behind 194 East Utica and his decision to fully renovate and invest in this property testifies to his commitment to greening and growing this emerging near East Side neighborhood. I'll make sure to post information here about a series of 'work days' Rod is planning this Spring. There are a number of fallen trees from the October Storm that are still strewn about and of course, crops to plant. This is going to be amazing. I spotted this sign the other day on the sw corner of Best and Jefferson. That's the Stanley Makowski Early Childhood Center - report card - on the right and the crumbling 'Rock Pile' on the left. If anyone knows more about this project, please let me know. Research I did at the Buffalo & Erie County Historical Society suggests that McBride's (115-117 Chicago St.) may be too young to have served as a Fenian site. Recall that the Fenian raid was in 1866. However, it should still be considered landmark-eligible. The full text of Cynthia's update is available, right here. If you're interested in learning more about Buffalo and the city's buildings make certain to visit Cynthia's site - Buffalo Research. 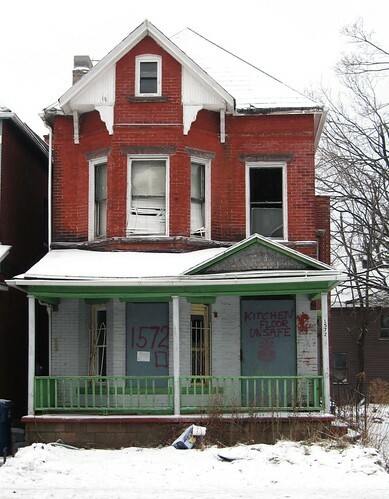 I've had a few recent requests to re-post some of the most intelligent analysis of our current dilemma here in Buffalo, NY - you know the problems presented by abandonment and vacancy. 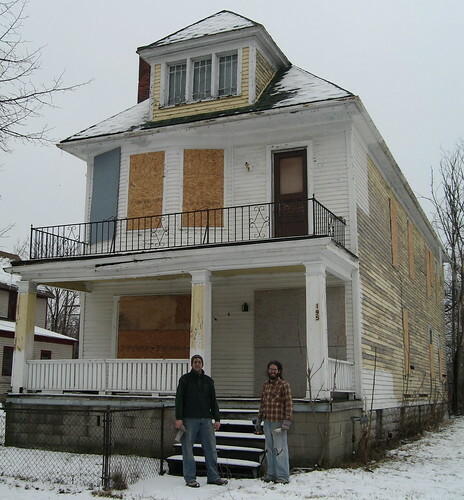 fixBuffalo readers may remember - Getting Smarter about Decline - from November 2006. I've archived Blueprint Buffalo, both the action plan and policy brief. 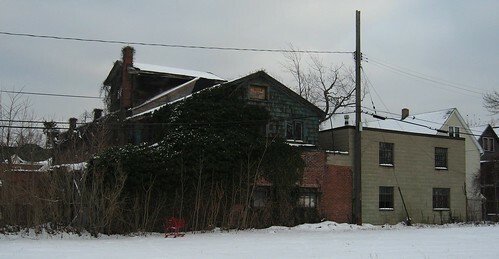 Local Initiatives Support Corporation (LISC-Buffalo) and The National Vacant Properties Campaign have collaborated and presented a compelling set of documents that need to be critically read, examined and absorbed by the elected, annointed and community leaders in Buffalo and across the region. Moments ago I received e-copies of both reports from the folks at LISC. The Blueprint Buffalo uses James Q. Wilson's work as a point of departure for this analysis. 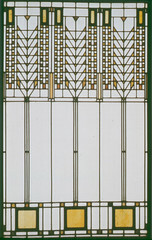 The full text of Wilson's article Broken Windows appeared in Harper's, March 1982. A friend of mine, Lisa Schamess - post to Lisa's blog - was the project editor for Blueprint and works at The National Trust for Historic Preservation. She's currently managing the first-ever State of Preservation in America report. In the next few days I'll be collecting a number of the other planning documents relating to various urban planning issues confronting our City. 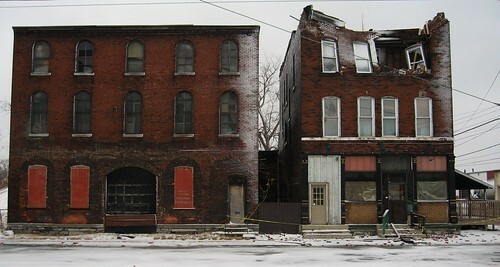 Abandonment and vacancy issues in Buffalo, NY were shared with the nation again today in the following AP story that appeared in the New York Times - Cities Fight Glut of Vacant Houses. Rust Belt cities, already beaten down by a miserable economy before foreclosures began spiraling nationally, are moving to cut the number of houses left vacant when the mortgage can't be paid. At stake are valuable tax dollars and the survival of neighborhoods...read the rest. Details and stories from Cleveland and Baltimore are included along with Mayor Byron Brown's 5 x 5 demolition scheme. Buffalo's own Cindy Cooper is quoted in the article, too. She made the front cover of Business Week last month in a story about what happens when banks walk away from foreclosures - Dirty Deeds and Toxic Title. 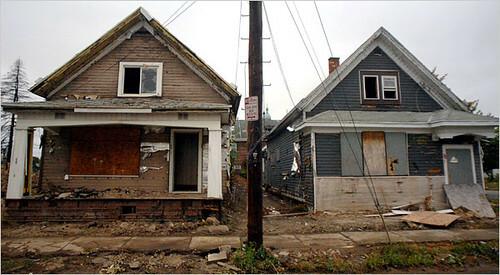 fixBuffalo readers may remember a New York Times article from last September - Scourge of a Beaten Down Buffalo that showed Buffalo having more vacant houses - on a per capita basis - than any other city, except St. Louis. I first wrote about Cleveland's Housing Court in 2006 when local housing activist Michele Johnson visited Judge Pianka with über City Inspector, Tracy Krug and Judge Nowak - Housing Court in Cleveland. A number of very cool late 19th century buildings are ready to disappear in this ever amazing shrinking city of ours. All four of these buildings are viable and located on major public transit lines and next to existing assets in Buffalo. These four places go and you have to wonder what are we fighting for...more vinyl victorians, I know. 1610 Main Street has seen an endless stream of activity in recent years. 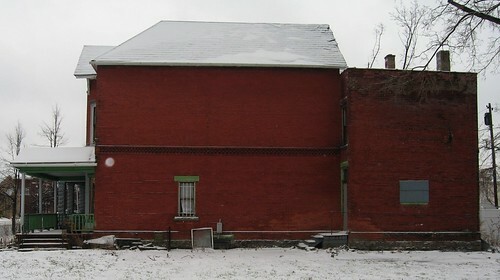 A neighborhood resident purchased this late 19th century spot five years ago for $12,000. A fire ripped through part of the structure two years ago and recently Housing Court Judge Hank Nowak has approved an order for its demolition - index #380-2006. 1610 is located near this wide open lot, that seems to be shovel ready and is very close to one of the coolest lofts on Main Street - In the Springs! - that I posted about a year ago. 115 Chicago Street - aka, McBrides Irish Bar - was the recent focus of a story by Geoff Kelly over at Artvoice - Silver Lining, last week. I first wrote about it in September 2006 - Historic Buffalo on Ebay. Another very fast moving case of 'demolition by neglect'. 1572 Jefferson Avenue is almost gone. 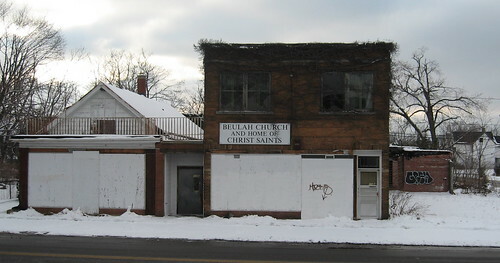 The City of Buffalo has owned this since October 2006 and the demolition order stapled to the boarded front window is dated August 13, 2007. I've shown this house to at least three interested individuals in the past two years. I first wrote about it in August 2006 - right here about the same time I was reacquainted with the fascinating terra-cotta tile house at 16 Harwood Place. If I were starting over, I'd begin here at 1572 Jefferson Avenue. The adjacent houses are very well cared for, you're a few blocks from Canisius College and the back square addition with a flat roof would make an amazing deck. Then there's 1325 Michigan Avenue that I wrote about last week, again - Last Chance. Four very cool places that will no doubt disappear from the streets of Buffalo very soon, from our consciousness abit later. Interested...hurry! Once these are gone...you know what's next, the continuing suburbanization of our city - aka, Sycamore Village. I know, some people call his progress. I've been following the construction of the home of Bethel Head Start for the last few months at the corner of Woodlawn and Jefferson Avenue. Yesterday I noticed that the steel sides of the building were in place. Two recent posts - December 2007 and November 2007 show the site's development. Any one know of other buildings here in Buffalo that have gone up in the last few years using similar materials and construction techniques? Looks more like a pre-fab dairy barn, if you ask me. Please, if Elmwood Avenue - think Lexington Food Coop - has design standards, shouldn't Jefferson Avenue? Think the new Jefferson Market Place - June 2006 - and the Merriweather Library - April 2006. Come on, this would never pass on Elmwood or Hertel. Why here?